A deeply misunderstood sports legend, once the most hated and loved man in America, gets his due in this absorbing, revelatory biography. Howard Cosell was one of the most recognizable and controversial figures in American sports history. His colorful bombast, fearless reporting, and courageous stance on civil rights soon captured the attention of listeners everywhere. No mere jock turned "pretty-boy" broadcaster, the Brooklyn-born Cosell began as a lawyer before becoming a radio commentator. "Telling it like it is," he covered nearly every major sports story for three decades, from the travails of Muhammad Ali to the tragedy at Munich. Featuring a sprawling cast of athletes such as Jackie Robinson, Sonny Liston, Don Meredith, and Joe Namath, Howard Cosell also re-creates the behind-the-scenes story of that American institution, Monday Night Football. With more than forty interviews, Mark Ribowsky presents Cosell's life as part of an American panorama, examining racism, anti-Semitism, and alcoholism, among other sensitive themes. Cosell's endless complexities are brilliantly explored in this haunting work that reveals as much about the explosive commercialization of sports as it does about a much-neglected media giant. “Mr. Ribowsky's book is an entertaining read and a thought-provoking portrayal of the multi-faceted Howard Cosell in all his glory and enmity. It is based on voluminous, well-sourced research into print and electronic material, coupled with numerous interviews with Cosell's contemporaries. ...the book vividly depicts Cosell as a brilliant meteor that soared through the electronic sky before ultimately fading, dimmed by controversy, age, exhaustion and perhaps his own obstreperous personality. 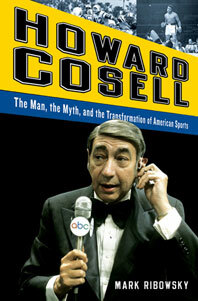 Warts and all, there has never been, and may never be again, anyone quite like Howard Cosell.” — Don Ohlmeyer, former president of NBC West Coast and produced of "Monday Night Football" from 1972 to 1976, Wall Street Journal "Bookshelf"